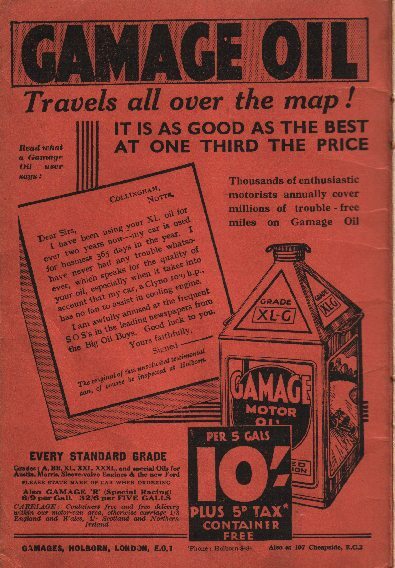 This page looks at petrol and oil company adverts on British maps, especially from before the 1939-45 war, when few petrol companies sponsored their own maps, probably because until the 1950s most filling stations sold a variety of competing brands. As such they were not tied to a particular fuel supplier, but free to take petrol and other goods, such as maps, from whoever they wished. This meant that petrol companies were more inclined to promote their fuel through conventional adverts, including ones on roadmaps. However many of the largest cartographers - such as Bartholomews - sold maps with no advertising at all. None of the maps on this page are shown elsewhere on this website. This is possibly the oldest British petrol advert from a map. Dating from 1910, it promotes Petroles de Grosnyi (Russie), which sold P.G.R. motor spirit. P.G.R. was a Belgian owned sales company, as may be seen from its telegraphic address of "Behaeghe", which was acquired by Petrofina in the 1920s. The advert was placed inside a Bacon's Road Atlas of the North of England, which had 24 plates mounted on cloth. Sold for 2/6d a volume, there were three atlases in the Bacon's set. As motoring grew after World War I, the main motoring clubs extended their services for members. The AA briefly opened its own filling stations; the RAC developed its touring department which, inter alia, published official town plans drawn by Ed. J. Burrows of Cheltenham. Plan No. 8 was of Coventry and can be tentatively dated to 1922 (it does show pre-grouping railway names). The plan opened out to just 16cm x 13cm and was pasted onto the left edge of the inside rear cover, partly hiding the advert for 'Shell' Motor Spirit. Its rear cover promoted Filtrate oils and grease; a third advertising page inside the front cover was taken by the Car & General Insurance Corporation. The Pictorial Weekly replaced the Penny Pictorial from November 1926 to October 1933. Probably towards the start of this period, as the maps lacks road classification numbers, it produced a "sectional Atlas of Great Britain for Motorists, Cyclists and Walkers." 24 pages of two colour maps by Geographia were stapled into orange-brown card covers measuring 200mm by 140mm. At the scale of 15 miles to the inch, they would have been of very little use to walkers! There were just three adverts, on the insides and rear of the card covers, from London department store Gamages of Holborn. One promoted Gamages "Popular" Cycles, another Gamages Starter & Lighting Batteries, and the third Gamage Oil (Enlarge). This was described as being "as good as the best at one third the price" and included a testimonial from the owner of a Clyno 10.9hp car. Despite operating just two stores and a mail order business, Gamage's 5 gallon cans are often found preserved, due to their superb graphic panels (far right). 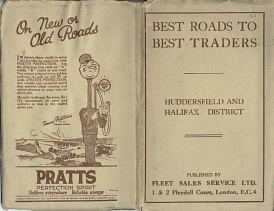 London-based Fleet Sales Service Ltd produced a number of advertising maps in their "Best Roads to Best Traders" series. The map itself was centred a little South of Huddersfield and Halifax in the West Riding of Yorkshire but covered an area 150 miles square at about 9 miles to the inch. However it occupied less than half the area of the map sheet; around it were 26 two colour adverts averaging 5" by 4". The range of businesses was broad: a hotel, motor dealers (one promoting the 1926 Morris range), several butchers, an Irish linen merchant, the Halifax Building Society and, in prime position underneath the map, "PRATTS for Power". Image shown at 4/3rds normal scale. The rear cover had an attractive ad featuring Tommy Prattkins of the Petrol Patrol (soon to be superseded by Ethyl!). The message concluded with "My spirit...as pure and uniform as that in the sealed green can", showing how some motorists were still suspicious of buying from the pump. An earlier Pratts advert was used between 1916 and 1920 on the inside rear covers of Michelin sectional maps of the British Isles. This still showed the sealed can, as well as two royal warrants (to the King and Queen). Pratt's was the only firm ever allowed to advertise on UK Michelin maps. 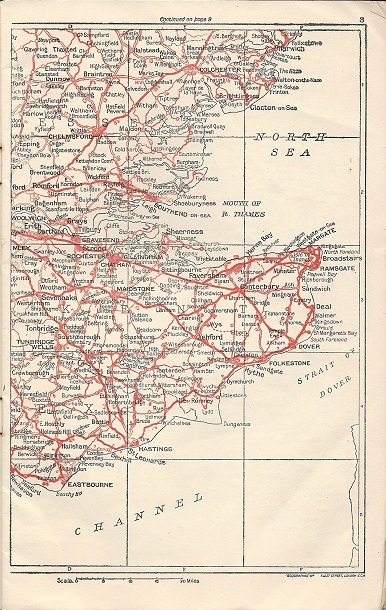 In 1930, Newnes gave away a Bartholomew's map of Britain with its popular "Titbits" magazine. Although there were several large advertising panels on the reverse, Pratts (by then lacking the apostrophe) restricted itself to sponsoring the compass rose on the map, to promote its new High-Test Petrol grade. 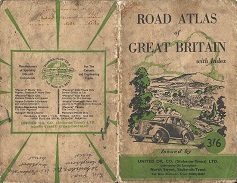 Ed J. Burrow & Co. continued their association with the RAC into the 1930s, when they issued a series of paper covered atlases described as "County Road Map & Gazetteer of England & Wales in 24 parts". In fact most sections covered several counties, although no. 18 was just of Lancashire and the Isle of Man. Four additional sections covered Scotland and Northern Ireland. Each atlas contained around 100 pages, including 8 pages of colour maps at around 4 inches to the mile. All included many pages of local advertising, mainly for hotels and motor garages, but no. 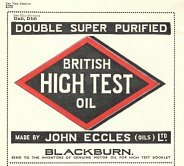 18 included a half page advert for John Eccles (Oils) Ltd, inventors of genuine Double Super Purified British High Test Motor Oil. Eccles appears to have been incorporated in 1930 in Blackburn and wound up in 1969, but little is known about its products which were probably only available regionally. 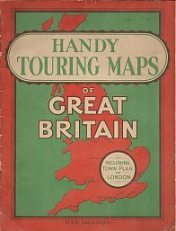 Sometime in the 1930s, George Newnes published their Handy Touring Maps of Great Britain as a medium format softback atlas. The maps were at the relatively small scale of 12 inches to the mile (1:760320) and the Town Plan of London advertised on the cover was an extremely rudimentary b/w map showing major routes only. BP took a full page advert on the rear cover; the inside covers had b/w adverts for Royal Lochnagar whisky and Bravingtons jewellers. Although this map is not of Britain, it was aimed solely at British tourists visiting Europe in the immediate post-war era. The Dover-Ostend ferry line produced a light card folder for their 1950 season. Entitled "With your Car to BELGIUM and GERMANY by DOVER-OSTEND" it contained a set of five simple strip maps allowing motorists to go from Ostend-Gent-Brussels-St. Truiden-Aachen-Köln, presumably en route to Allied war graves in Germany. Key cities along the route were described briefly, and the rear of each section carried an advert for Belgium, Ostend, Brussels or Liege, in the hope that tourists might be persuaded to stay longer in Belgium itself. The inside pockets of the folder were given over to Esso adverts: the left one stating "as in your country You are used to perfect service. In Belgium, as in your own country, if you call for Esso you will find the same facilities..." Perhaps no-one had told Esso's advertising agent that the UK was still distributing petrol under the wartime Pool monopoly, and Esso had not been sold there for over a decade! R-M de Puydt of Brussels assembled the package, the rear cover of which comprised a ferry timetable and rates: a small car and four passengers could still get to Ostend for Â£12. In 1953 Motor-Maps Ltd of Burton upon Trent published a series of six simple maps, extended to national coverage of 18 in 1954, with 25,000 copies printed of each section. Available for 4d each (or 10/- post-paid for the set) each listed around 50 recommended hotels which users were assured were selected on merit and had not paid for inclusion. The map is shown at two-thirds relative scale. 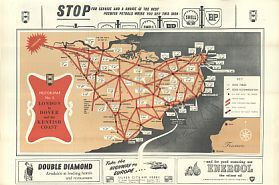 The maps also included a number of small adverts: Double Diamond beer and BP-Energol Oils appeared on most, with some including a Shell-BP sign graphically rising above the map. The accompanying text read "STOP for service and a choice of the best premier petrols where you see this sign - SHELL-BP". This advert was timely as it was the year that branded petrol had replaced the Pool monopoly after more than 10 years. Fleet Sales Service later produced small format road atlases, on which advertisers could overprint their details. Although the front cover said "Issued by", they were available for any company prepared to pay. They are undated, but believed to come from the early 1950s. The version for England & Wales contains 20 pages of fairly basic two colour maps prepared by Geographia Ltd. Although many road distances are included, expressed to the nearest &half; mile, road numbers are omitted, limiting their usefulness. The Great Britain variant cost a shilling more, but ran to 24 pages, omitting a larger scale map of Greater London. Of the two examples shown above, one comes from what appears to be the Leeds sales office of Shell-Mex and BP Ltd. 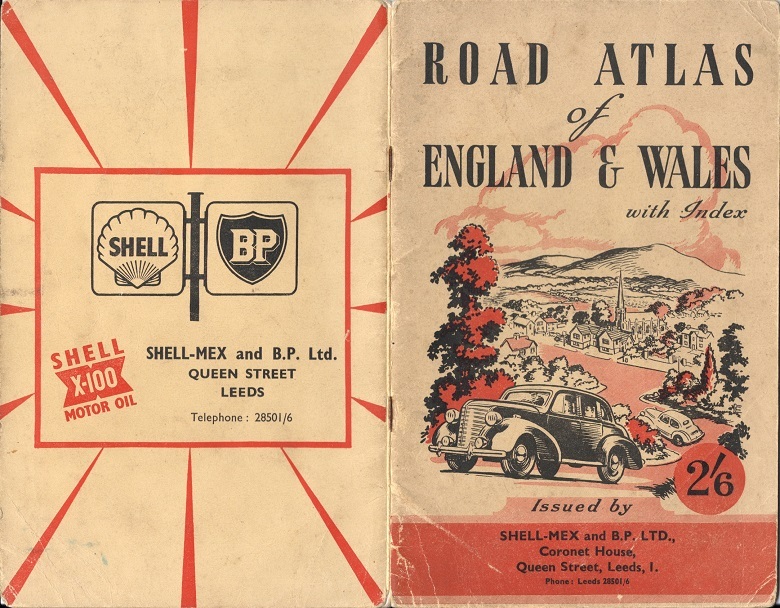 It is unusual not to have come from a head office so may have been an early response by a local sales manager to the Esso maps introduced around 1950, at a time when Shell only sold expensive Foldex maps (and BP had no map offering at all). 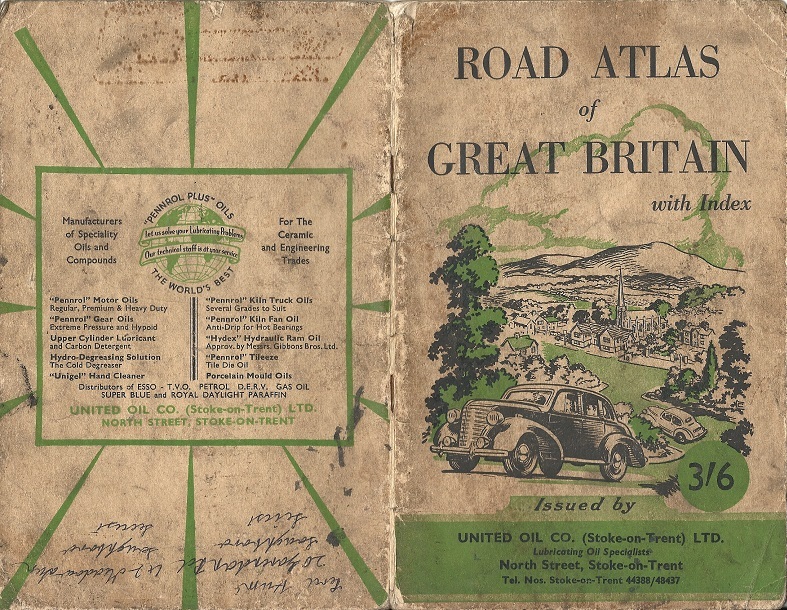 The other map, sadly in very poor condition, was issued by United Oil Co. (Stoke-on-Trent) Ltd. This seems to have been primarily a blender of speciality oils for the ceramic and engineering trades using the name "Pennrol Plus". However they also produced regular motor oils, upper cylinder lubricants and, among other products, "Hydex" Hydraulic Ram Oil. Almost as an aside, the mention being distributors of Esso TVO (tractor vaporising oil), petrol, D.E.R.V. (diesel), gas oil and paraffin. Incorporated in 1936, this company was later taken over by Thames Liquid Fuels (who supplied petrol under the Thames and Sotro brands) and was eventually re-purposed as a trader in old coins! It's possible, but not likely, that they would have supplied sone service stations with Esso petrol, but more likely that their customers were purely commercial. Street maps can be found of most British towns. Although some were produced locally for free distribution by estate agents, the market leaders for commercial maps have been Geographers' A-Z, G.I. Barnett and Service Publications (SP Maps). SP created a series of 81 Street Plans and Guides, in which nearby places to visit were described on the rear of the map; the street index was a separate booklet stapled inside the map's card cover. SP was established in 1947 and sold maps until 2005, when competition from online mapping (and, I suspect, A-Z) led it to focus solely on publishing diaries. 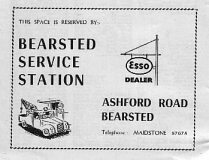 Its maps carried adverts for local businesses; the example shown here for an Esso dealer in Bearsted, Kent comes from an early 1960s map of Maidstone. In 1966-7, the British Travel Association produced a set of 24 motor tours of Britain on low quality paper, using very basic vector cartography. The inside was wholly given over to the itinerary, identifying points of interest and including a few pen and ink drawings of principal sights. It is possible that non-English language versions were also printed. 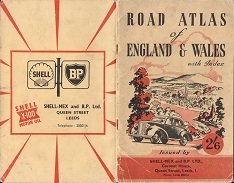 When folded the rear covers carried adverts, as shown from Shell (1, 4, 7, 10...), BP (2, 5, 8...) or National Benzole (3, 6, 9...) and the front cover referred to the same brand's motor maps. The three brands were still linked into a marketing joint venture known as Shellmex & BP. 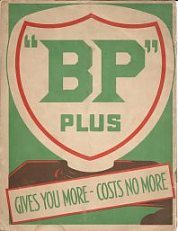 The adverts did not vary between sections: Shell's promoted its maps, Shilling guides and Super Oil; National's its maps and eight books discovering Britain on water and on land; and BP simply used an advert saying "Get BP SUPERFORMANCE for the car in your life". Motoring magazines have occasionally given away road maps as an incentive for readers. Practical Motorist did this most often in the 1960s placing the entire country onto a single sheet, often using a limited colour palette. The map shown above right dates from around 1962, and was prepared by W & A.K. Johnston & G.W. Bacon Ltd at 16 miles to the inch. The reverse side was wholly devoted to black & white adverts from Holts Chemical Maintenance Products, but the map side carried a footer advert from Silver Knight Motor Oil (R.M. Matthews Oil Ltd) - below. Silver Knight had grown rapidly in the 1950s with the move to DIY car maintenance through a policy of selling its oils through car accessory shops, notably the market leader, Halfords. A later Practical Motorist map, dating from 1966, was solely sponsored by Castrol (right) and printed in Castrol's house colours of red and green. More recent adverts are rarer on maps; either petrol companies sponsored their own maps, or they chose to place their adverts in other media (such as TV) or through promotional activities. ICI Petrol was regionally based, so it made sense for it to buy the sole advertising space on this 1977 Estate Publications map of Yorkshire & Humberside. "You'll love Yorkshire. And your car will love Yorkshire's favourite petrol." says the ad, "As long as you're here, fill up and enjoy it." In 1988 ICI sold its petrol distribution business to Burmah.